What’s your most frequent excuse for not joining a fitness class? You’ve never tried one. It’s been years (and years). They’re too hard. You don’t know which one is best for you. The bottom line is, when working on their own, most people don’t work as hard as they would as when they exercise with a group. The class will also hold you to a regular schedule. Many people will skip other social events if it means missing a Tai Chi or strength training class. Seniors and other retirees have the advantage of more open time on their schedule. This is a fantastic opportunity to look out for your health and classes are a great place to start. Need more reasons? Keep on reading. Even if you’ve never tried a class before, chances are there will be others there in the same boat. It’s okay. A good instructor will know how to push the veterans without leaving the rookies out of the mix so don’t think you’re holding others back when you’re new. At one point or another, everyone in the class was in your shoes and you’ll be grouped with others of similar experience. Plus, many classes won’t be allowed to continue without a certain number of participants so new blood is always welcome, even if it’s in old bodies! As was said earlier, you generally work out harder in a group setting. Your mind will want to quit long before your body is actually hitting its limits. Here’s the thing about stress: introducing your body to systemic cycles of stress and recovery actually trains your body to recover from injury and illness more quickly. You will start feeling mentally stronger as your physical strength increases, warding off feelings of depression and increasing your confidence level. You couldn’t sleep – or were just bored out of your tree. You turned on the TV and started watching an infomercial for some outrageous body sculpting exercise program like, “P75 Body Zone Blaster,” or whatever. With high expectations, you bought it – maybe even a new workout outfit or shoes that no one will ever see – and, when it finally arrived, put it into your DVR, watched it 3 times and somehow never got back to it again. It was hard. So hard that you couldn’t keep up and you started feeling down about yourself. By the third run-through, your body is screaming at you and you realize you might be doing yourself more harm than good. Too embarrassed to return it, you sell it on eBay or it gets tossed into the bin of stuff that’s being collected for your next garage sale. This is why instructors at legitimate gyms are licensed to teach. 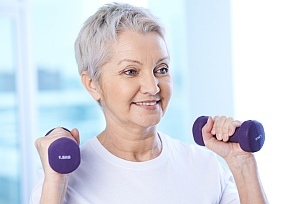 They go through certifications to work with groups, to work with muscles, and to work with strength training for older adults. You can ask the gym to see these certifications. If they can’t provide them, go to another gym. The instructor should be able to push you to your limits without injuring you or forcing you to do things that you simply cannot do. In fact, an instructor should ask you if you have any injuries or limitations that could prevent you from doing any part of the class. Tell them and they will find a work-around for you. That’s why you go to a class – there isn’t a video out there that will listen to what you’re saying or recognize if you’ve pushed yourself too far. You Can Play Well With Others! There are a multitude of choices for getting fit. When you join a class of like-minded individuals, all doing what you enjoy, you’ll feel a sense of empowerment. Remember how great it was to go out at recess and play with the people to just forget about math for awhile? It’s like that. Your exercise class shouldn’t feel like drudgery and there’s no reason to continue on if you don’t like it (or other participants). A good rule of thumb is to give a class 4-6 weeks. That will help you get past the learning curve and any first-timer’s anxiety you may feel when getting started. Some of these class are so fun, you can develop some great friendships that extend beyond the classroom. Believe it or not, you’re a wonderful person! As long as you’re here on this beautiful planet called, “Earth,” you should enjoy every minute of it. You’ll have more minutes to enjoy if you take care of yourself the way you take care of your car, your garden, your music collection – whatever gives you joy. Pay attention to your health now and it will pay dividends for years to come. 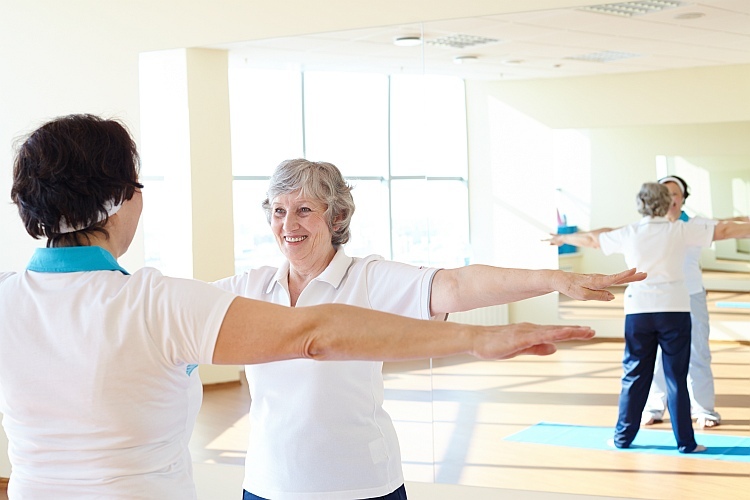 If you’re living on a fixed income because of retirement, you may not be thinking that an exercise class is in your budget, but did you know that most YMCA’s offer discounts to seniors? Most other gyms do that, too. With so many fitness franchises asking just $10 per month, the only thing you need to do is give up the, “all you can eat,” pizza buffet once a month… something your waistline has probably been begging you to do anyway. You’ve tried putting in the work at the gym but are wondering if you’re doing everything the right way. You second-guess yourself, wondering if you’re missing something. So many machines and maybe you’ve been going too long to ask for help. So you spend hours on the internet – fitness sites, YouTube – trying to find answers that could be just one class away. Most classes target a combination of strength, stamina (cardio) and stability. Here’s the secret: That’s all any workout offers. So why not go to a class with a certified instructor, get in your workout and leave your time open for other things, like re-reading Tolstoy. Group fitness usually has appropriate music – high energy ditties that get your feet moving and your blood pumping. Combine that with the right instructor and some interesting class participants, and you’ll be excited to get after it week after week. That’s a bigger reward than any treadmill is going give you which is no wonder they so often make the best coat racks.